Two resident Killer Whales (orca whales) surfing at high speed in a boats wake in the Pacific Ocean off british Columbia in Canada. Killer Whales, also called Orca Whales, Orca or Orcinus Orca is the largest member of the Dolphin Family. This is a rare shot of Killer Whales surfing in a boats wake. 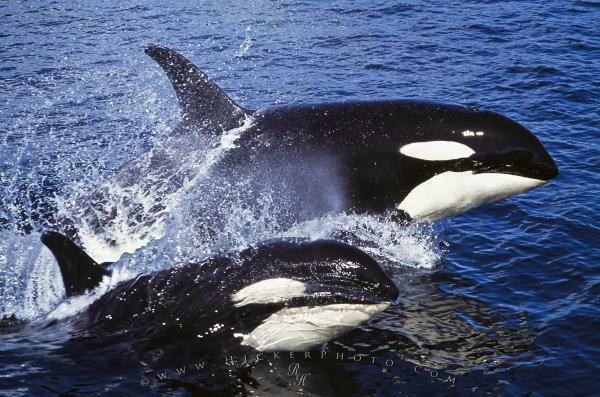 Killer Whales are seperated into 3 Groups, Offshore, Resident and Transient Killer Whales. Please visit my photo gallery with more pictures of Killer Whales (aka Orcas) and information about them.